The Instances package (9.10) targets the big OOP paradigm of object-class relationship. It allows to illustrate a 'snapshot' of an object during run-time. Note that this isn't modelling the M0 (run-time instances) layer of the 4 layer meta-model hierarchy, but at the M1 (User model)-layer as the class itself. Up to now all classes of the meta-modell are abstract (not instancible). 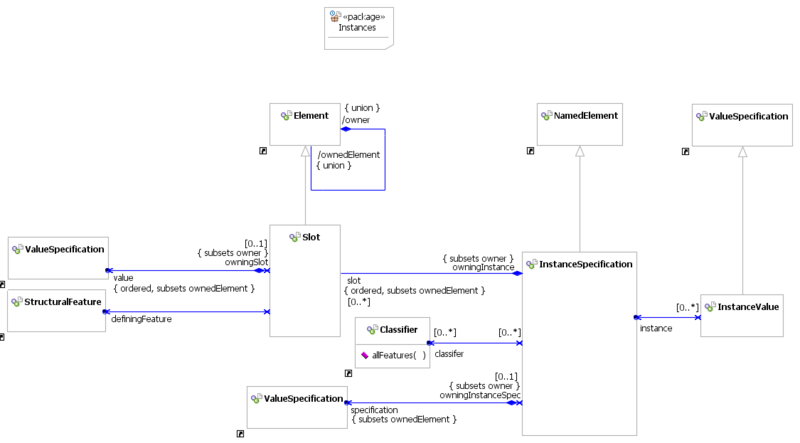 Once there are concrete classes, I will see how an instance in uml will look like.